Jurors have found Liam McAtasney guilty of all seven counts in the murder trial of Sarah Stern, whose body was never found. Brian Thompson reports. The 21-year-old New Jersey man on trial in the death of a childhood friend has been found guilty of murder, robbery and other charges. Jurors reached the guilty verdict against Liam McAtasney Tuesday afternoon. He'd been accused of strangling former high school classmate Sarah Stern and throwing her body off a New Jersey bridge more than two years ago. Her body was never found. McAtasney will be sentenced in May. In a briefing after the verdict announcement, First Assistant Prosecutor Lori Linskey thanked jurors for their eight weeks of service "in a very, very long case" and offered continued condolences to the Stern family, saying "although the trial is over, we understand that for the Stern family, this never really ends." 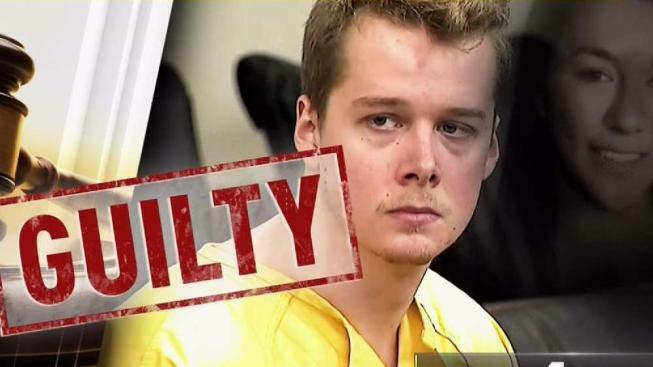 Trial prosecutor Chris Decker added, "When you're asking a group of 14 people -- ultimately 12 people -- to convict someone especially so young of a crime like murder, it's not an easy thing to do. You could obviously see that from the jury's reaction on the way out... But I think ultimately, at the end of the day, justice was served." Prosecutors said observing an apparent lack of remorse by McAtasney while his grisly confession tape played in the courtroom during trial was especially telling. "There was no emotion from him," said Meghan Doyle, one of the trial prosecutors. "As prosecutors, that does make you angry. There's no emotions, nothing. He was so dismissive of what he did." Watching that video in court, father Michael Stern said, was "sickening. It was gut-wrenching." He added, "The most important thing is to get justice for Sarah. She was a great kid and it never should have ended like this." Monmouth County prosecutors allege that McAtasney strangled the 19-year-old Stern during a December 2016 robbery he thought he was going to get $100,000 from it but only got about $8,000. He and a friend, prosecutors allege, then dumped her body off the Route 35 bridge in Belmar, leaving her car on the bridge to make it appear that she committed suicide. Defense attorney Carlos Diaz-Cobo, however, told jurors in his closing argument Friday that there was reasonable doubt that the victim was dead, since her body has never been found. "Without a body, there is no murder," he said. McAtasney chose not to take the stand on his own behalf. A week before Stern disappeared, McAtasney told a friend he planned to strangle Stern and make it look like a suicide, Doyle said at the trial. McAtasney’s friend, an aspiring horror filmmaker, didn’t take McAtasney seriously, Doyle said — believing his friend was simply describing an idea for a horror film. Lawyers for McAtasney subsequently made the request for a mistrial after the juror — a motion that was denied. Jurors also saw a chilling video capturing McAtasney confessing in a car and revealing chilling details of the alleged killing. "She was just a beautiful person," Michael Stern said of his daughter. "She didn't have a mean bone in her body. And she was a great artist, and hopefully in the future we'll be able to see some of her artwork and get it on display somewhere."